Humility Essential Oil was blended to promote forgiveness, humbleness and humility. It is important to be able to forgive ourselves, others and god so we can transform emotionally and spiritually. When we are resistive and not open to changing ourselves, then we stay stuck in our relationships and our situations. If we stay open and release these negative emotions, we can move forward into a place of acceptance. And when we transform ourselves we are ultimately transforming those around us and our planet. This is an easy reference guide for Humility Oil Blend. It will tell you how to use your oil blend and what to use it for. It will also provide you with some fun tips and testimonials! Want to Purchase Therapeutic Humility Essential Oil? Go to the Oil Shop! Buy Humility Oil Here! What is in Humility Essential Oil? Please Note that Humility oil was revised in summer of 2012 because of the deforestation and limited availability of Rosewood Essential Oil. See below for revised formula. 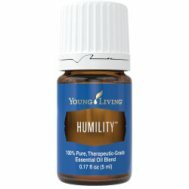 There are nine therapeutic grade essential oils in Humility! They are listed below along with a brief description of each oil. Myrrh Essential Oil (Commiphora myrrha) s a very powerful antioxidant; and it supports healthy skin*. Rosewood Essential Oil (Aniba rosaeodora) is soothing to healthy skin and it is emotionally stabilizing and is used for relaxation. Neroli or Orange Blossom Oil (Citrus aurantium amara) Known for its transformational effects on the mind and spirit it is a highly regarded oil used in Ancient Egypt. What are the Documented Uses for Humility Essential Oil? Agitation, anger, argumentative, frustration, irritability, jealousy, obsessiveness, resentment, spiritual, and stress. What is the Spiritual Influence? Humility essential oil helps to release the emotions of not good enough and bitterness. This will bring in positive emotions of self worth, contentment, humility and faith. It will also help with feeling emotionally exhausted from beating oneself and being self critical. It will teach you how to love yourself and feel proud of your own accomplishments. Best placed over the heart, temples and on the neck.